Terre Haute-David Lee Blakely, 87, of Terre Haute died Thursday morning, January 31, 2019. He was born in Terre Haute on May 16, 1931 to Arthur Blakely, Sr. and Abigail John Blakely. He was preceded in death by his parents; a brother, Arthur Blakely, Jr.; and his son, Steven L. Blakely. He is survived by his wife Marilyn Neet Blakely; a daughter in law, Kimberly Edwards Blakely; three grandsons, Thomas Arthur, John Paul and David Henry Blakely all of Danville, IL. David spent almost 30 years as a teacher of social studies at Woodrow Wilson Middle School for Vigo County School Corporation. After graduating from Garfield High School in 1949, he attended Indiana State University earning his bachelor’s, master’s and 30 additional hours of work in secondary education and administration. His years at Wilson were satisfying and enjoying. He served as chairperson of the social studies department during that time an was instrumental in initiating the Tajimi, Japan Student exchange program in which he was actively involved for over eight years. Students had a year of Japanese language and culture lessons before trips. David took a special interest in all students. David was an army veteran of the Korean War stationed in Japan and Korea. He retired master sergeant of the Indiana National Guard with over 38 years of military service. David was awarded the 113TSF Senior NCO in 1997 and the MERITORIOUS SERVICE AWARD in 1989. He was the last surviving member of the Air Force Squadron 31 Last Man’s Club composed of Air Force Retirees. David was baptized in the Barbour Avenue United Brethren Church in January 1934 where he attended as a child. 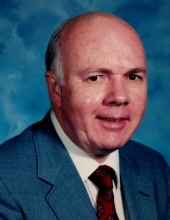 He was a Charter Life member of the Alumni Association at Indiana State University, a former member of the Elk’s Country Club, Life member of the Vigo County and State Teachers Association and a life member of the National Education Association. David enjoyed life: hunting, fishing with his grandsons, traveling extensively in many parts of the world, sports, good music, politics and making cherry and apple pies that will be missed by his family. He and his wife brought not-to-be-forgotten food from their kitchen which their families and friends enjoyed. Private graveside services are scheduled for a later date. Memorial contributions to the Vigo County School Corporation at 686 Wabash Avenue, Terre Haute, IN 47807 or to the charity of choice. To send flowers or a remembrance gift to the family of David L. Blakely, please visit our Tribute Store. "Email Address" would like to share the life celebration of David L. Blakely. Click on the "link" to go to share a favorite memory or leave a condolence message for the family.